Hair drug testing measures the drug molecules embedded inside the hair shaft eliminating the risk of contamination from external factors (e.g. the person would not be able to claim the test for cannabis was positive because they were in a smoky room). This drug test will test for all the common drugs misused in the UK. The price quoted includes everything – there is nothing more to pay to get a full laboratory accurate analysis. It will take approximately 10-15 business days to get the reply back to you with a fully itemised/detailed drug test report. Tests for 6 drugs of abuse. Covering up to 90 days of drug misuse. Requires a 1 and a half inch hair sample. 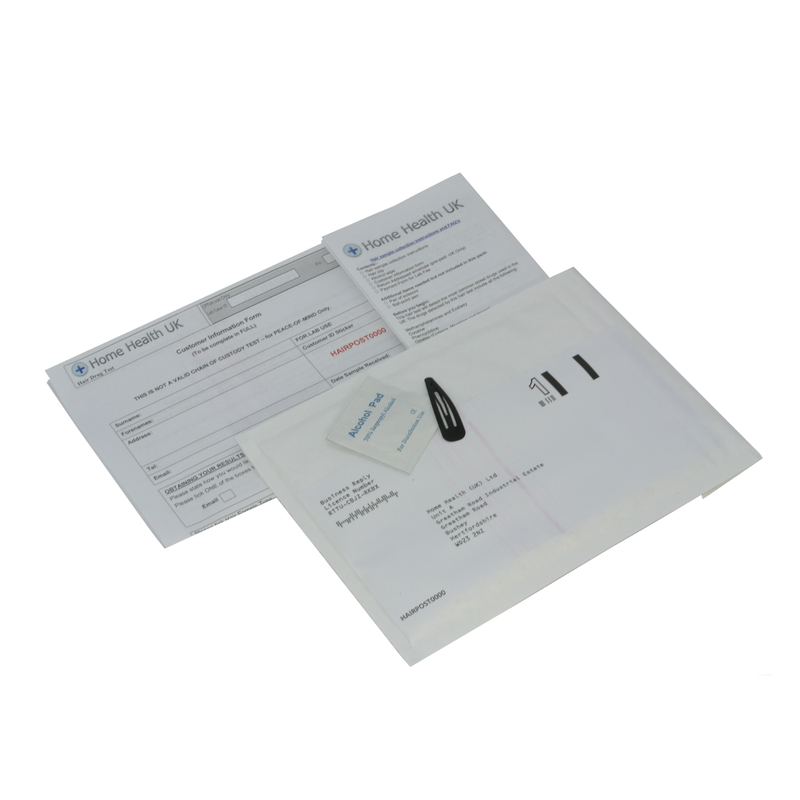 The hair drug testing kit is carried out by a fully accredited laboratory in Canada. How good is this hair drug testing kit? 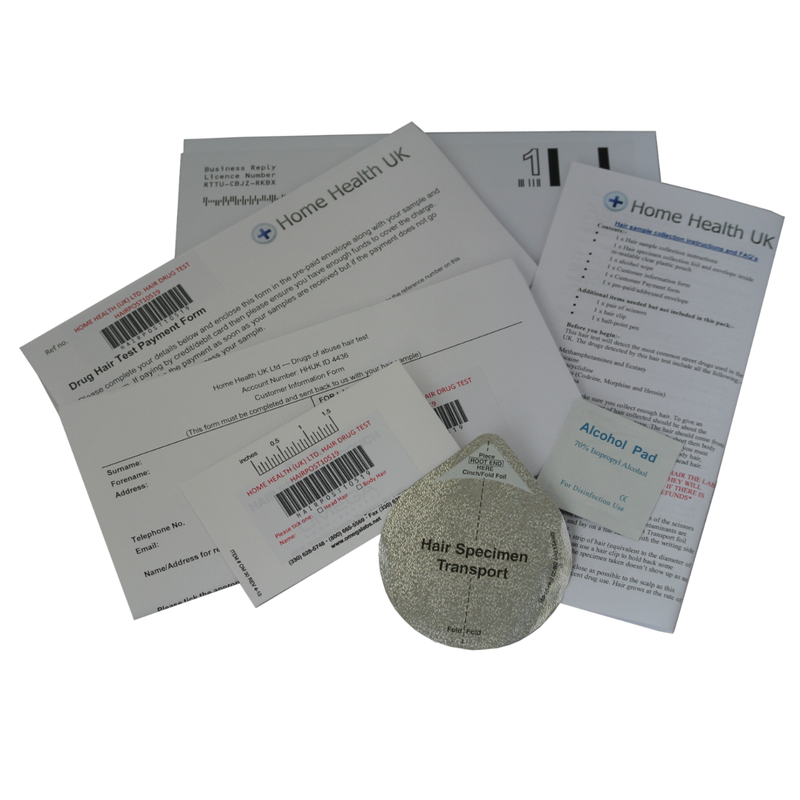 Simply put, we are one of the largest suppliers of Drug Tests to the NHS and treatment centres throughout the UK. 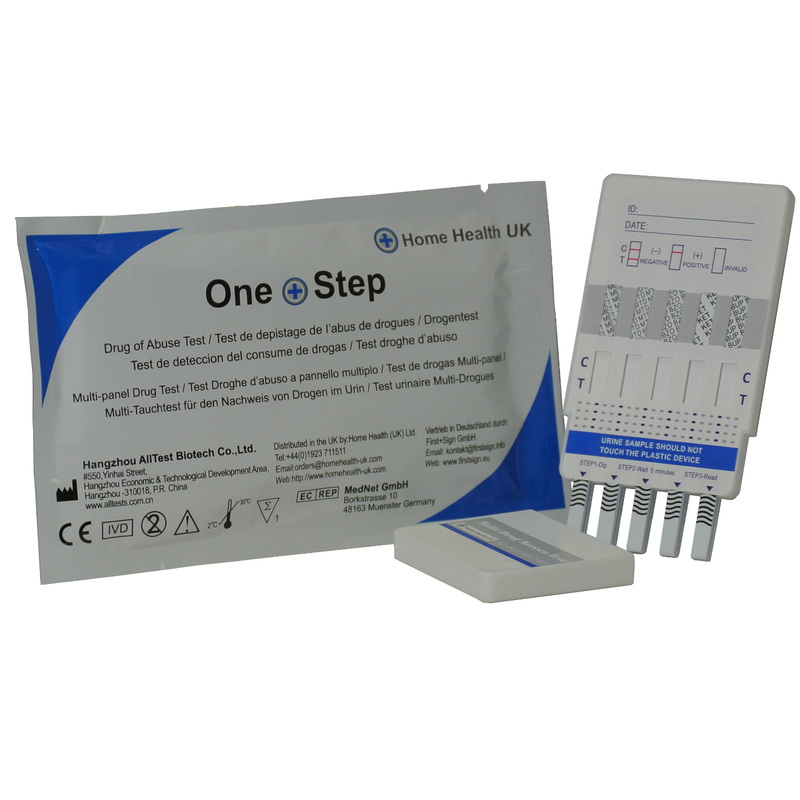 This test is identical to the one we supply to the NHS. All you have to do is simply collect a lock of hair from the person being tested as close to the scalp as you can. Using the special hair collector pack simply pop the hair sample back to us in the provided reply paid package and complete your details on the enclosed form. It will take approximately 10-15 days to get the reply back to you with a fully itemised/detailed drug test report. This result can be mailed, emailed or phoned to you. You simply tell us how you want the result when you fill in your details with the sample. This hair based drug test is accurate (99.9% accuracy) and is very difficult to fool. Hair drug testing measures the drug molecules embedded inside the hair shaft eliminating the risk of contamination from external factors (e.g. the person would not be able to claim the test for cannabis was positive because they were in a smoky room where there were many cannabis users). As the test is testing inside the shaft of the hair the results cannot be altered with shampoos, bleaches or other external chemicals. If someone tells you about a shampoo/conditioning system that will “clean” the hair then the only thing we have found that really works is chemicals that will dissolve/destroy your hair!! You should NEVER use such treatments to try and fool a hair drug test. How much hair do I need and can I use body hair? The sample should fill the diameter of a typical drinking straw and that will be about 120 strands of hair. More strands are needed if the hair is particularly thin. Hair grows at about 1.3 cm (0.5 inches) per month so to get a result covering 90 days about 4cms (one and half inches) is required. If you send a sample longer than 4cm’s then the “newest” hair will be used to cover the most recent 90 day period. It is important that the hair collected is presented with the hair nearest the scalp pointing in the direction shown on the sample collection foil. Ideally you should only use head hair but if this is not possible (where the head hair is very short or shaved) then body hair can be used but it must NOT be mixed with scalp hair (body hair grows at a slower rate than head hair. The body hair can be from underarm, chest or pubic hair but never mixed with hair from the head. What if the hair is very short? The hair can be much shorter but you still need a good sample of 120+ hairs. In these instances the detection times will cover a shorter period depending on how long the hair is. Does hair colour affect results? Hair colour is determined by the amount of melanin in the hair. It has been shown experimentally, through actual hair samples, as well as determined in court that hair colour has NO basis in fact. Studies indicate that head hair grows on the average approximately 1.3 cm (or 1/2 inch) per month. This growth rate varies slightly (estimated at ± .3 cm per month), consequently there is some (± 1 week) time variation possible. It takes approximately 4-5 days from the time of drug use for the affected hair to grow above the scalp. Body hair growth rates are generally slower and cannot be utilized to determine a timeframe of drug use. If usage of drugs in a shorter time frame is required then a urine and/or saliva drug test should be used. Full details are on our web-site. 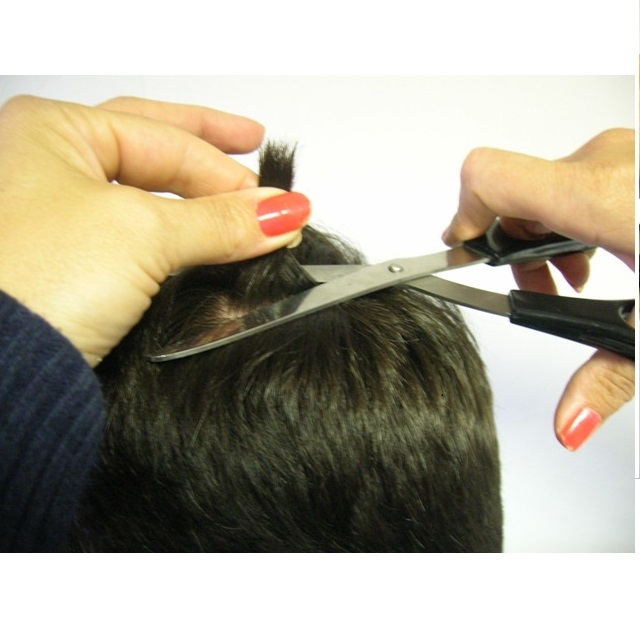 Hair can be collected from several head locations and combined to obtain the required amount of hair. In addition, body hair may be used as a substitute to head hair. In the rare case where no hair is collectable, a urine and/or oral drug test can be used. Full details are on our web-site. Yes, body hair can be used though body hair growth patterns are different than head hair. Most body hair is replaced within approximately one year. This means a test done with body hair will be reported as drug usage during approximately a one year timeframe. Yes, as long you can collect enough hair. How effective is Hair Drug Testing in detecting drug users? In side-by-side comparison studies with urinalysis, hair drug testing has uncovered significantly more drug use. In two independent studies hair drug testing uncovered 4 to 8 times as many drug users as urinalysis. The main reason for this is that many drugs of abuse such as cocaine are quickly metabolised and expelled by the body and detection times can be very short (2-3 days only). It is well known that many drug users will, for example, use cocaine on a Friday night knowing they will probably be undetectable for cocaine use by the Monday morning. The laboratory report will give a positive/negative result for each drug tested. From the result we will be able to give some indication as to the severity of use for each drug type tested except cannabis. What this means is that for each positive result we will be able to tell whether the person is a low (occasional), medium (week-end/daily) or high (constant) user of that drug. The cannabis result is qualitative which means the amount does not correlate to usage. 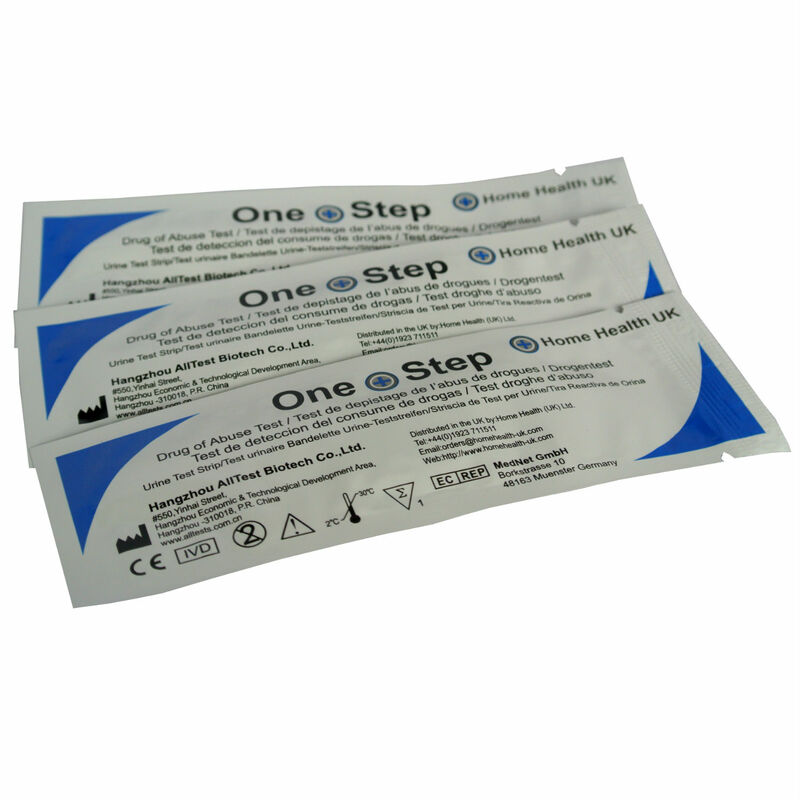 Depending on your result a good way to ensure a person stays clean is to use a much cheaper urine drug testing kit of which we sell too. 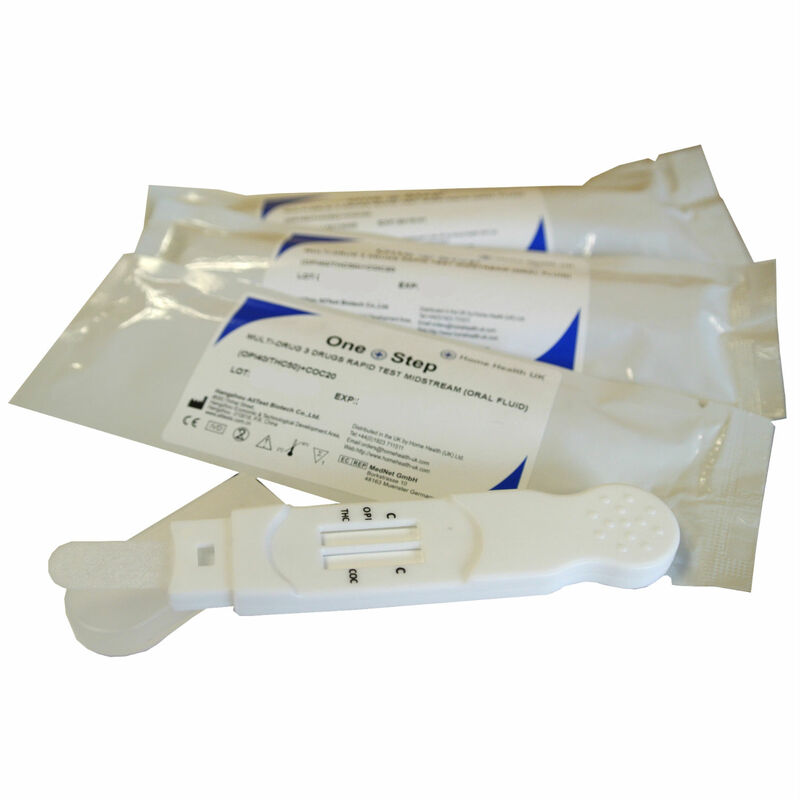 To view and buy these tests click here. Can these results be used in court proceedings? No these tests are strictly for peace of mind only and the test will be reported as having an “anonymous” donor. This is because it is impossible to attribute the sample to any specific person or persons. The test will only report the levels of drugs that were found in the sample submitted. What if I am based overseas? We ship to any Country in the world and if you are outside the UK then as the sample is hair you only need to put the correct Air Mail postage locally to send the sample back to us. What should I do if I get a positive result? If you are a professional user then you will have taken the required steps as part of your professional standards to ensure the employee or person being tested fully understands the consequences of a positive drugs test. We would always suggest you discuss the findings with the person being tested to determine the next steps. But I am a worried parent so what should I do then? What if I need professional help locally? The UK Government have an excellent web-site that is confidential and can provide all the guidance and help you may need. Kit arrived fast posted off and received results within 2weeks; I’m a bit sceptical of the results so ordered another 1 and going to test someone who i know is actively drug using and has been for years. Im Disappointed that it didn’t test for benzodiazapines which is one of the major drugs of abuse along with heroin and cocain.